Finnish really is one of the world’s easiest languages. I was reminded of this again earlier today while taking in Snapshots, a fine show of recent paintings by young local artist Arto Kettunen, in the Käytävägalleria (“Corridor Gallery”) at Imatra’s cultural center, Kulttuuritalo Virta (“Stream House of Culture,” so called because it is situated alongside the once-raging Vuoksi River, dammed up on both ends during its now-short course in Finland—the rest of its length was lost to the Soviet Union during the Winter War (Talvisota) and Continuation War (Jatkosota)—to generate electricity). 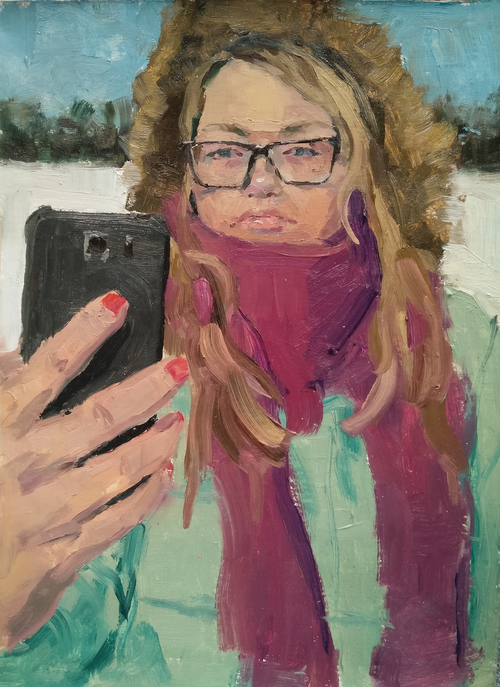 Arto Kettunen, Sara ottaa selfien, 2016. Oil, 37 cm x 27 cm. 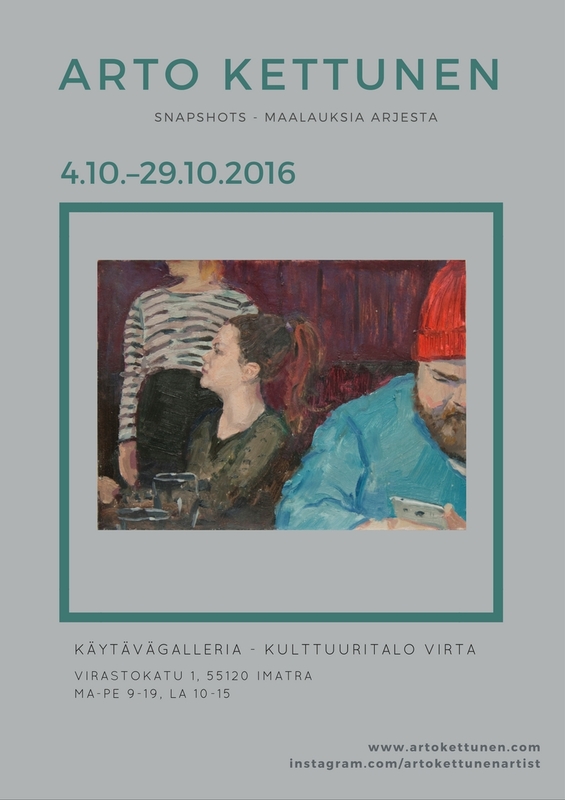 Mr. Kettunen’s show runs until October 29. Be there or be square. Arki is the nominative case of the word, which means, alternately, “weekday” or the ordinary, mundane days in life, the everyday. Given its mundaneness, you hear the word constantly in daily life—for example, in advertisements for daily specials at grocery stores. The non-Finnish part of me (which is all of me, since I’m not Finnish) would like to wax poetic about the supreme importance of everyday life to Finns and Finnish culture (as opposed, say, to ruling the world), and how that makes Finland such a lovely, safe place to live most of the time, but I lack the words, even in English, to describe its complex simplicity.